Plentiful in seasonal fall spa and beauty treatments, pumpkins are a treat for the skin with their skin-nourishing vitamins, enzymes, and antioxidants. Photo by Harald Bischoff [GFDL (http://www.gnu.org/copyleft/fdl.html) or CC-BY-3.0 (http://creativecommons.org/licenses/by/3.0)], via Wikimedia Commons. Fall is here in Southern California, so I’m all about soaking up the best the season has to offer — and I might add, enjoying the slightly cooler weather! I’ve not only eaten pumpkin-inspired foods and drinks for breakfast, lunch, and dinner, but have even slathered pumpkin on myself in the name of beauty! I know. Sounds a little excessive, right? Why do I do it? Well, canned pumpkin purée and fresh pumpkins are so bountiful right now, I can’t resist. Plus, pumpkins and the other natural ingredients in this autumn treatment are full of several skin-nourishing benefits that leave skin silky soft and smooth. And doing this treatment at home saves me some serious cash. If I were to go to a spa and indulge in a seasonal pumpkin body treatment, it would probably cost close to $200 or $300. But for under $10 per treatment, I can give myself one at home. So, why not whip up this 100% natural, homemade body mask for yourself? Depending on how much you use, you might have enough for a second one, which means you can treat your honey as well! Plus, you can modify it to suit your needs and skin type. You can even make it 100% organic. Finally, if you like the idea of turning it into a spa wrap instead of a body mask, you can do that, too. Sounds like a win-win situation, right? 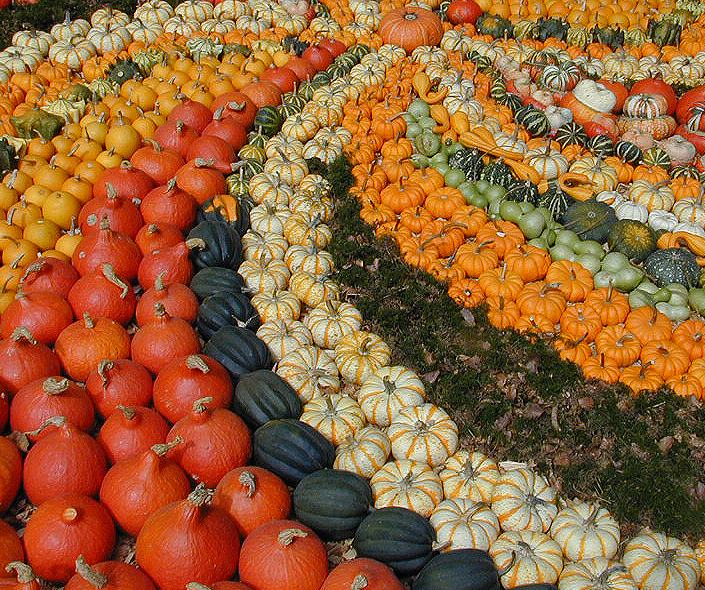 Pumpkins are great at moisturizing and nourishing the skin with their Vitamin C, Vitamin A, and zinc content. Also, because pumpkins and papaya contain enzymes that naturally exfoliate and slough away dead skin cells, you are left with the appearance of smaller, tighter pores and fewer fine lines and wrinkles. In essence, the enzymes act like alpha-hyrodoxy acids (AHAs) would in an over-the-counter skin product targeted towards treating mature skin, acne, and discoloration. But the benefits don’t stop there. The other natural ingredients in this mask/wrap (most of which you probably already have in your own pantry) are great for the skin as well. The honey draws moisture to the skin and also works as a natural antibacterial. The cream is very moisturizing and also contains lactic acid, a natural alpha hydroxy acid. The addition of essential oils supports the skin as many promote cell renewal, treat sensitivity, and moisturize the skin — just to name a few of the benefits. Finally, the spices, which lend a pleasing “pumpkin pie” scent to the treatment, are natural antibacterials and increase blood circulation. So, you see, this pumpkin-papaya body mousse mask/wrap really is versatile. It works well for all skin types and is also great for acne and as an anti-aging treatment. You’ll be left with smooth, moisturized, and rejuvenated skin and wonder why you haven’t tried something like it sooner! Promise. In addition to giving yourself a body mask or wrap treatment, try doing this homemade Pumpkin Walnut Body Scrub beforehand (it’s great for increasing circulation and exfoliating the skin). Also, why not give yourself a luxurious pumpkin facial? Simply use the same ingredients in the mask minus the spices (they might be too strong for facial skin) or try the facial recipe described in this post. And don’t forget to sip on something healthy and festive, like this Pumpkin Chai Tea Latte while you’re at it. Makes enough for 1-2 applications. Note: If you can’t find fresh papayas in the supermarket, sometimes they are available in the frozen section. But if you omit them, this renewing treatment will still work great. Simply substitute the papaya with more pumpkin. Papayas contain the enzyme papain, which helps loosen the bonds between dead skin cells, thereby exfoliating the skin and reducing the appearance of fine lines, wrinkles, and large pores when used topically in spa and beauty treatments. Photo by Scott Bauer, USDA ARS [Public domain], via Wikimedia Commons. For dry or mature skin, you may add in a couple drops of frankincense essential oil (Boswellia ssp. ), which is very moisturizing and encourages the growth of new skin cells, thereby reducing the appearance of wrinkles. For sensitive skin, add in 2-3 drops of organic lavender essential oil (Lavandula angustifolia). You may also want to omit the use of the spices if you are especially sensitive. Also, be sure to only leave the mask/wrap on for about 10 minutes and remove it at any sign of irritation. For oily or acne-prone skin, mix in 1-2 drops of bergamot essential oil (Citrus bergamia), which is a natural antiseptic that is not only great for acne, but useful for also treating wounds, psoriasis, and eczema. If you’re going into the sun afterwards, choose bergaptene-free bergamot essential oil, because bergaptene has found to be phototoxic on the skin. For normal skin, a blend of ginger CO2 (Zingiber officinale), blood orange (Citrus sinensis), and frankincense essential oils (Boswellia ssp.) complements the natural mask ingredients. Add in 1-2 drops of each, but error on the side of less if you’re skin is sometimes sensitive. First, puree the pumpkin and the papaya by mashing it with a fork or putting it in a blender. Then whip the heavy cream. Next, fold in the other ingredients. If desired, add in essential oils. Note: This may be made in advance and refrigerated for a day or two, but before using it, let the mask reach room temperature. To apply the pumpkin-papaya body mouse as a mask, apply the mixture to your entire body on clean, damp skin while in the tub or shower. Leave it on for 10 – 20 minutes. (If you have particularly sensitive skin, opt for less time.) Then rinse well and pat your skin dry. As an alternative, you may do a body wrap. Wrap yourself in an old sheet or a new, unused plastic drop cloth (available from any home improvement store for about $2) and then cover yourself with a blanket. The use of a plastic sheet not only eliminates mess, but also assists with moisture retention and penetration of the product. Relax for 10-20 minutes. (Again leave it on for closer to 10 minutes if you have sensitive skin.) Then rinse the wrap off and follow with a moisturizing lotion if desired. If you have very sensitive skin, you may want to shorten the amount of time you leave this mask/wrap on. If you notice any irritation while using it, remove it immediately and rinse with cool water. I once had a spa party and a friend of mine, who is very fair skinned, applied this to her face and her skin got very red within a couple of minutes. It went away, but still, no one else had that happen, so just be conscious of your own skin-type. 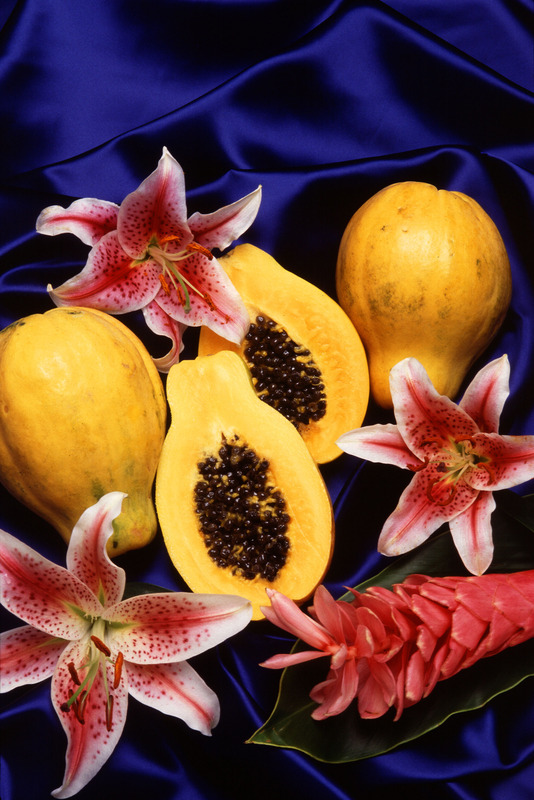 The enzymes in the papaya and pumpkin are quite powerful! If you have a latex allergy, omit the papaya from this recipe. As noted in this article, those who are allergic to latex may also have allergic responses, such as hives, to vegetables or fruits that contain proteins similar in nature to those found in latex, such as papayas, bananas, kiwis, etc. This spa treatment is a great one to keep in mind with Halloween and Thanksgiving coming up. After all, pumpkins are plentiful this time of year. So, do you think you may give it a try? Would you modify it in any way? If you don’t think you’d use it yourself, would a friend or family member enjoy it? If so, please help spread the word. Social shares are always welcome! Copyright © Karen Peltier and Well Gal, 2012-2014. All rights reserved. ← I Chomped on Some Crickets for a Quick Protein Fix. Would You? what is the benefit of this mask? It’s so simple to make edible creams 🙂 Fun, cheap and they may end up being delicious too! Wow, how many great benefits from pumpkin. More and more people become aware of using chemical free products on their skin. You are providing great information to do this in our home at a much lesser cost! This looks fab Karen, I bet the scrub smells gorgeous with Papaya in it. Plus it makes great use of the leftover pumpkin from carving. Kyle Nelson recently posted…Are You A Morning Person? I’m so glad to hear that both you and your wife embrace natural home remedies. Thanks for sharing the recipe with her! Hello Karen, Pumpkins are very plentiful this time of year, so this my friend is a very helpful post! I for one cannot wait to try out your mask..
Chery Schmidt recently posted…How I Developed A Successful Mindset! Mm. I can feel the nutrients and moisture soaking into my skin :). Sounds awesome. I would definitely give this a try. Wow… I’ve heard of pumpkin pie, pumpkin cookies, pumpkin pudding, and pumpkin butter, but never pumpkin body wrap! Interesting. Anything natural is far better than chemical, so it certainly worth considering for anyone who uses body wraps. Thanks for sharing. Great way to save money and take care of your body! Going to the spa and being pampered cost way too much and it would be simple to prepare what you did. Pumpkins are rich in various vitamins and if you don’t like it, you could use a variety of other vegetables instead, like avocados. Thank you for sharing and I will mention this to my mom!